XRP had a tremendous run in the last week. With Swell and xRapid going live still looming do the bulls still have fuel in the tank? 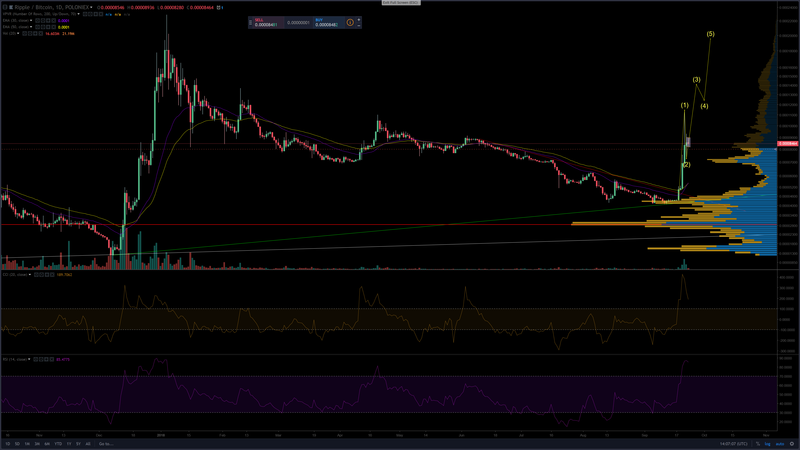 First let's take a look at the Daily chart for the XRP/BTC pair. Though the RSI and CCI indiactors on the daily still indicate very overbought conditions when a coin is on such a tremendous run as XRP has been these indicators can linger in overbought for an extended period of time. Looking at the previous run up and comparing it to XRP's current movements we can see a number of similarities. Namely the large pump over a couple of days followed by three to five days of consolidation. 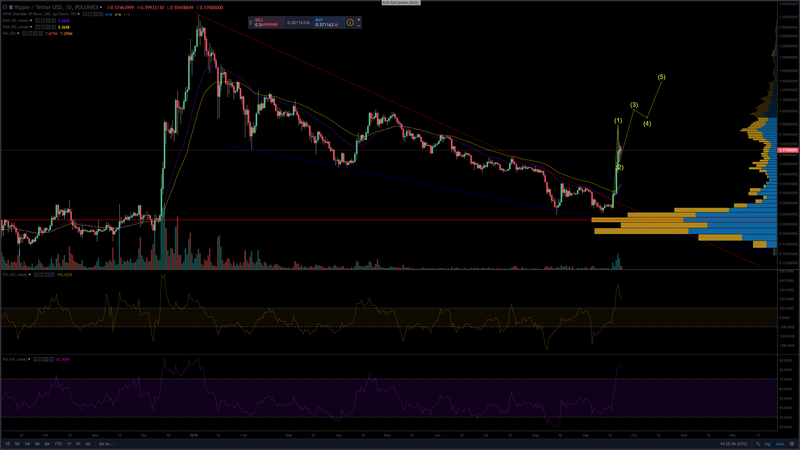 Looking at this as a normal trend for XRP, as the actions are similar across every major move up, we can reasonably expect that XRP is not done. Though there remains the possibility of some more retracement the R/R is in favor of the bulls. 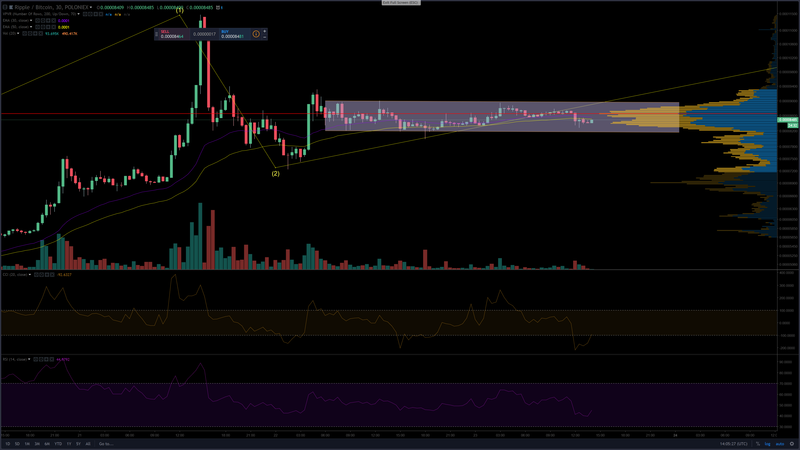 On major pumps XRP likes to follow Elliott Wave patterns, and applying such to the XRP/BTC pair gives us a target of 14000 sats for Wave 3, followed by another area of consolidation, and a Wave 5 target of 19500 sats. With the anticipation of xRapid going live, and the news of expansion from Ripple's other products the bullish sentiment is likely to remain across the market. Breaking it down to the smaller time frames, we'll take a look at the 30-minute chart. 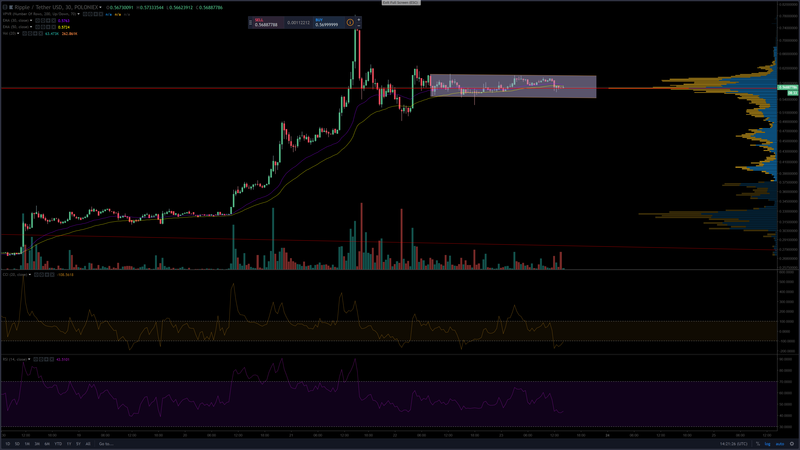 The XRP/BTC pair continues to consolidate in the 8200 - 9000 sat range. With the small time-frame indicators near bottom we can expect that the bulls will attempt a breakout of the range in the next 48 hours. If the bulls are able to breakout above 9000 sats it's likely to hit our Wave 3 target of 14000 sats. That said, a break down could push the pair to 7500 sats. Those seeking new entry positions are encouraged to wait for the break, whether it up or down, before making entry. The USDT pair stands to resemble the BTC pair. As the indicators are similar we will look at price movement. It's reasonable that XRP/USDT found the bottom on the Wave 2 highlighted on the chart. As such a bullish movement up will present the XRP/USDT pair with a Wave 3 target of $0.96, followed by a period of consolidation through Wave 4 and finally a Wave 5 target of $1.39. Again, the 30-minute timeframe resembles the BTC pair. XRP/USDT is consolidating in a range between $0.54 and $0.60. Those seeking new positions should wait for the break. A move above $0.60 would trigger entry and likely lead to our Wave 3 target of $0.96. A break down out of the range would see XRP/USDT fall back to $0.50 where the bulls are likely to mount a heavy defense and consolidate their position more.